The Color Me Beanie bear with made from a white material with black button eyes and a larger black button nose. He has either a yellow, orange, pink, red, blue, green, or slightly darker green ribbon tied around his neck. On his chest is attached a “Color Me Beanie” button. We know you will have loads of fun! 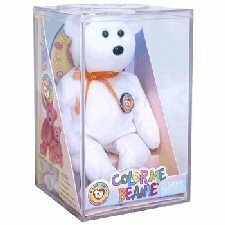 The Color Me Beanie bear was released on 29th August 2002. His birthday is on 11th December 2001. There were seven different ribbon colours available; yellow, pink, blue, red, orange and two shades of green. Each Color Me Beanie came in a plastic box with six marker pens that allowed you to colour the beanie how you wanted. The pens were the same colours as the available ribbons. A BBOC application form was included in each box. The Color Me Beanie bear retired on 27th December 2002.